We've been working hard to move dBSea along, and while we're still working on making the 3D solvers ready, we've almost finished another feature that we quite like, and hope that you will too. We now have a working alpha version of moving receivers, allowing for a much better estimation of animal impact by probing realistic routes used for daily foraging or seasonal migration. Figure 1. Example of moving receiver (purple) and stationary source (light blue). We've also added a few tools to make data extraction easier, the first of which is a simple received level over time. If you set dBSea to remember all source positions then the individual movement of source(s) and moving receivers will be taken into account. In figure 2 the source is stationary, while in figures 5,7 & 9 the source is moving. Figure 2. 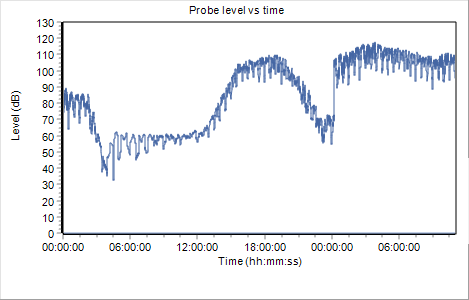 The received sound level over time for the receiver in Figure 1. 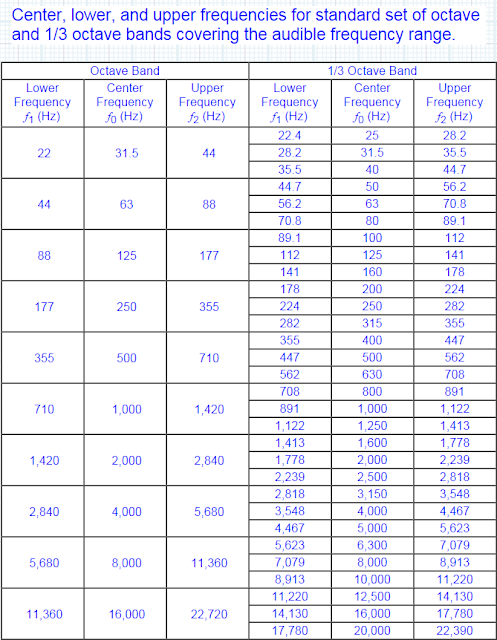 In the defaults settings dBSea shows you the maximum level at any depth at each position. The moving receiver lets you view the variation in level with depth at each point. 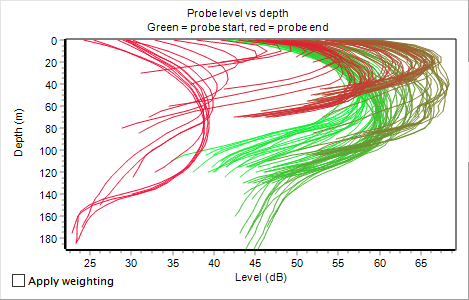 In figure 3 the depth-vs-level is shown, with green lines being the first points, and red the last. Figure 3. The level versus depth at all receiver positions. Bright green is start of track, red is end of track. Setting up the path i similar to setting up the path for a moving source, with options to add points manually, or import CSVs or GPX files of the desired movement. Figure 4. The motion of the moving receiver is set by entering easting and northing of waypoints, by importing GPX files or by dragging waypoints to their desired position. Figure 5. Source (yellow and blue) traveling through strait of Gibraltar and up Portuguese coast. 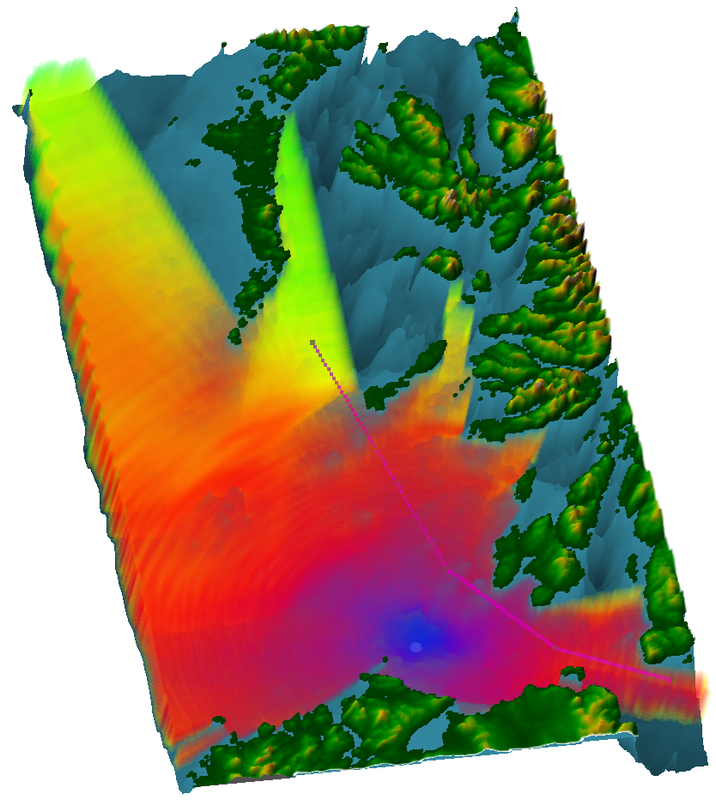 Receiver (green) travelling south with sinusoidal dive profile at 2 m/s. Figure 6. Level versus time for the path in figure 5. Notice the pattern in levels corresponding to a diving frequency of 1 dive/hour, as well as lower levels when seamounts are between source and receiver. The following illustrations might better explain the effect of accounting for the relative position and time of both source and receiver. First for source and receiver travelling the same way at the same speed. Figure 7. 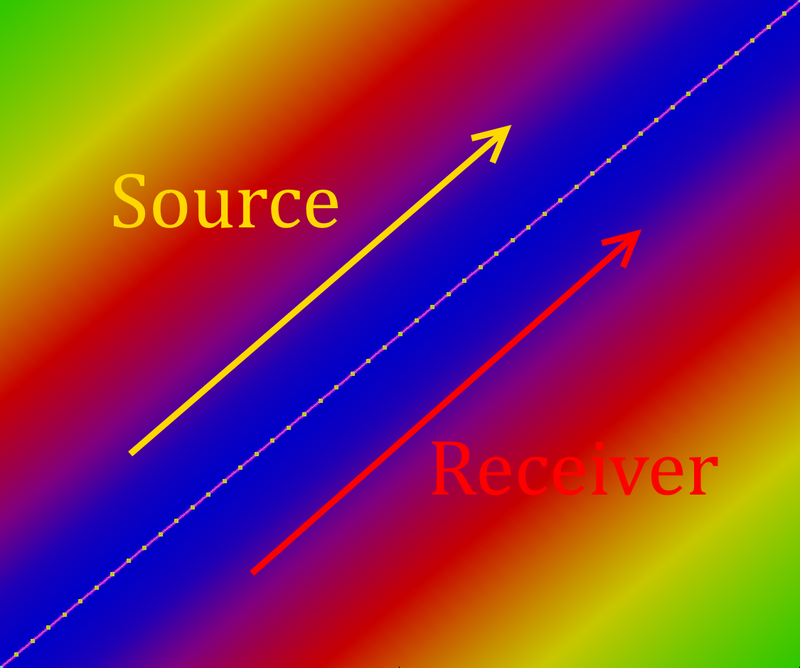 Source and receiver travelling at the same speed in the same direction. Figure 8. Level versus time for track in figure 7. 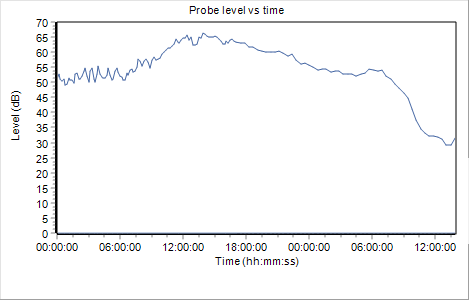 The small fluctuations in level is due to interpolation were receiver points are closer spaced than source calculation points. Then for source and receiver travelling in opposite directions at the same speed. Figure 9. 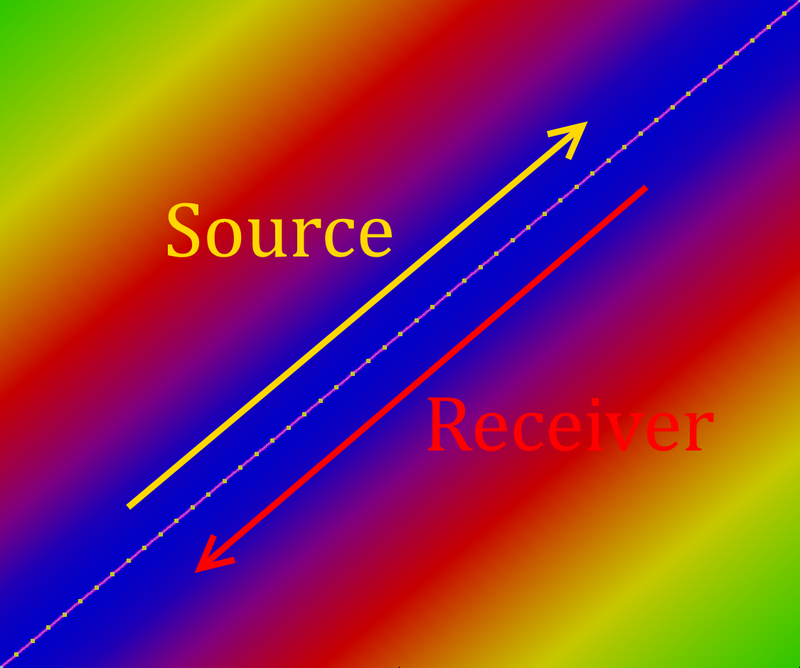 Source and receiver travelling at the same speed in opposite directions. Figure 10. Level versus time for track in figure 9. There are a myriad of other permutations of timing, level types (SEL, Leq, dBpk) and weightings that mean that this post could get very long, should I list all the options. We are almost done with testing of this new feature, which proved to be a lot more tricky to make than anticipated. Thanks for reading, and please don't hesitate to leave a comment or a question. As is often the case, my blog posts are based on conversations with dBSea users, and this is no different. 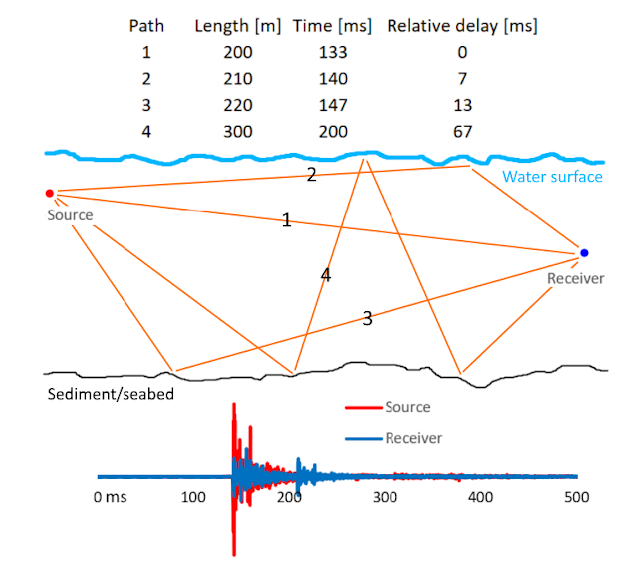 In underwater noise propagation modelling we are often tasked with finding both zero-to-peak, peak-to-peak and impulse-SEL (z-p, p-p, iSEL) for scenarios involving impulsive noise sources such as impact pile driving or seismic surveys (see ISO 18405- 2017 for details on sound metrics ). 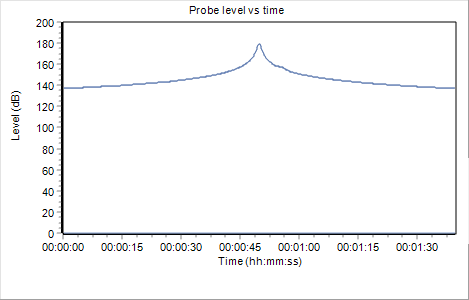 To calculate z-p and p-p levels we have to use a propagation method that allows us to take into account arrival times and phase for the arriving signal (Figure 1). In dBSea that means using the dBSeaRay solver that uses raytracing to find arrival times, transmission loss and phase of the impulse at all receiver positions in a scenario. When modelling, we're always simplifying nature in order to answer some generalised questions. However, sometimes we also simplify in order to save resources, more specifically save (CPU) time. dBSea (and many other propagation models) do no calculate propagation loss for the whole frequency range, but rather calculate the propagation loss for a small subset, usually every third octave. 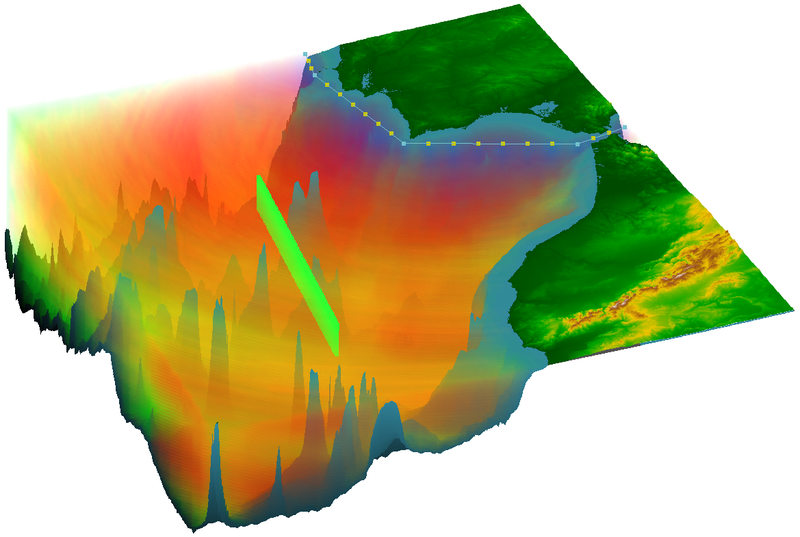 For simple scenarios this approach is not going affect results too much (compared to other contributors of uncertainty), but for rough seabeds, it makes quite a lot of difference. When sound interacts and reflects off a sediment the wavelength influences how this reflection, and resulting scattering plays out. Thus the frequency is important for the accurate calculation of propagation loss from bottom interactions.